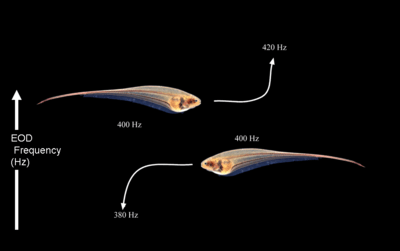 Two neighboring Eigenmannia perform the jamming avoidance response: When one fish with an electric discharge of 400 Hz encounters a second fish with the same frequency, one fish shifts its frequency upward and the other shifts its frequency downward. Jamming avoidance response (JAR) is a behavior performed by some species of weakly electric fish. The JAR occurs when two electric fish with wave discharges meet – if their discharge frequencies are very similar, each fish will shift its discharge frequency to increase the difference between the two fish's discharge frequencies. By doing this, both fish prevent jamming of their sense of electroreception. The behavior has been most intensively studied in the South American species Eigenmannia virescens. The behavior is also present in other Gymnotiformes such as Apteronotus, as well as in the African species Gymnarchus niloticus. The JAR was one of the first complex behavioral responses in a vertebrate to have its neural circuitry completely specified. As such, the JAR holds special significance in the field of neuroethology. The jamming avoidance response was discovered by Akira Watanabe and Kimihisa Takeda in 1963 while working at the Tokyo Medical and Dental University. 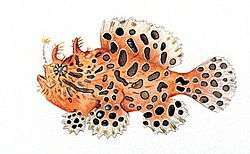 The fish they used was an unspecified species of Eigenmannia, which has a quasi-sinusoidal wave-like discharge of about 300 Hz. They found that when a sinusoidal electrical stimulus is emitted from an electrode near the fish, if the stimulus frequency is within 5 Hz of the fish's electric organ discharge (EOD) frequency, the fish will alter its EOD frequency to increase the difference between its own frequency and the stimulus frequency. Stimuli above the fish's EOD frequency will "push" the EOD frequency downwards, while frequencies below that of the fish will push the EOD frequency upward, with a maximum change of about ±6.5 Hz. This behavior was given the name "jamming avoidance response" several years later in 1972, in a paper by Theodore Bullock, Robert Hamstra, Jr., and Henning Scheich. The JAR was discovered in the distantly-related Gymnarchus niloticus by Walter Heiligenberg in 1975, showing that the behavior had convergently evolved in two separate lineages. Eigenmannia and other weakly electric fish all use active electrolocation – they can locate objects by generating an electric field and detecting distortions in the field caused by interference from the object. Electric fish use the electric organ to create electric fields, and they detect fields using special electroreceptive organs in the skin. All fish that perform JAR are wave-discharging fish that emit steady quasi-sinusoidal discharges. For the genus Eigenmannia, frequencies range from 240 to 600 Hz. The EOD frequency is very steady, typically with less than 0.3% variation over a 10-minute time span. If a neighboring electric field is discharging sinusoidally close to the fish's EOD frequency, then it will cause sensory confusion in the fish, jamming it and preventing it from electrolocating effectively. Eigenmannia typically are within the electric field range of three to five conspecifics at any time. If many fish are located near each other, it would be beneficial for each fish to distinguish between their own signal and those of others; this can be done by increasing the frequency difference between their discharges. Therefore it seems that the function of the JAR to avoid sensory confusion among neighboring fish. To determine how close the stimulus frequency is to the discharge frequency, the fish compares the two frequencies using its electroreceptive organs, rather than comparing the discharge frequency to an internal pacemaker; in other words, the JAR relies only on sensory information. This was determined experimentally by silencing a fish's electric organ with curare, and then stimulating the fish with two external frequencies. The JAR, measured from the electromotor neurons in the spinal cord, depended only on the frequencies of the external stimuli, and not on the frequency of the pacemaker. Most of the JAR pathway in the South American Gymnotiformes has been worked out using Eigenmannia virescens as a model system. When the stimulus frequency and discharge frequency are close to each other, the two amplitude-time waves will undergo interference, and the electroreceptive organs will perceive a single wave with an intermediate frequency. In addition, the combined stimulus-EOD wave will have a beat pattern, with the beat frequency equal to the frequency difference between stimulus and EOD. Gymnotiforms have two classes of electroreceptive organs, the ampullary receptors and the tuberous receptors. Ampullary receptors respond to low-frequency stimulation less than 40 Hz and their role in the JAR is currently unknown. Tuberous receptors respond to higher frequencies, firing best near the fish's normal EOD frequency. Tuberous receptors themselves have two types, the T-unit and P-unit. The T-unit fires synchronously with the signal frequency, by firing a spike on every cycle of the waveform. P-units tend to fire when the amplitude increases and fire less when it decreases. Under conditions of jamming, the P-unit fires on the amplitude peaks of the beat cycle where the two waves constructively interfere. So, a combined stimulus-EOD signal will cause T-units to fire at the intermediate frequency, and cause P-unit firing to increase and decrease periodically with the beat. The time-coding T-units converge onto neurons called spherical cells in the electrosensory lateral line lobe (ELL). By combining information from multiple T-units, the spherical cell is even more precise in its time coding. Amplitude-coding P-units converge onto pyramidal cells, also in the ELL. Two types of pyramidal cells exist: 1) excitatory E-units, which fire more when stimulated by P-units, and 2) inhibitory I-units, which fire less when stimulated by inhibitory interneurons activated by P-units. Spherical cells and pyramidal cells then project to the torus semicircularis (TS), a structure with many laminae, or layers. The TS is located in the mesencephalon. Phase and amplitude information are integrated here to determine whether the stimulus frequency is greater or less than the EOD frequency. Sign-selective neurons in the deeper layers of the TS are selective to whether the frequency difference is positive or negative; any given sign-selective cell will fire in one case but not for the other. Sign-selective cells input into the nucleus electrosensorius (nE) in the diencephalon, which then projects onto two different pathways. Neurons selective for a positive difference (stimulus > EOD) stimulate the prepacemaker nucleus (PPn-G), while neurons selective for a negative difference (stimulus < EOD) inhibit the sublemniscal prepacemaker nucleus (sPPn). These prepacemaker nuclei, PPn-G and sPPn, send projections to the pacemaker nucleus (Pn), which ultimately controls the frequency of the EOD. The neural pathway of JAR in the African Gymnarchus is nearly identical to that of the Gymnotiformes, with a few minor differences. S-units in Gymnarchus are time coders, like the T-units in Gymnotiformes. O-units code the signal's intensity, like P-units in Gymnotiformes, but responds over a narrower range of intensities. In Gymnarchus, phase differences between EOD and stimulus are calculated in the electrosensory lateral line lobe (ELL) rather than in the torus semicircularis (TS). There are two main orders of weakly electric fish, Gymnotiformes from South America and Osteoglossiformes from Africa. Electroreception most likely arose independently in the two lineages. Weakly electric fish are either pulse-dischargers or wave-dischargers; most are pulse-dischargers, which do not perform the JAR. Wave-discharge evolved in two taxa: 1) the superfamily Apteronotoidea (order Gymnotiformes), and 2) the species Gymnarchus niloticus (order Osteoglossiformes). Notable genera in Apteronotoidea that perform JAR include Eigenmannia and Apteronotus. Though they evolved the JAR separately, the South American and African taxa have convergently evolved nearly identical neural computational mechanisms and behavioral responses to avoid jamming, with only minor differences. ↑ Watanabe, A., Takeda, K. (1963) The change of discharge frequency by A.C. stimulus in a weak electric fish. J. Exp. Biol. 40: 57-66. ↑ Bullock, T.H., Hamstra Jr., R., Scheich, H. (1972) The jamming avoidance response of high frequency electric fish. J. comp. Physiol. 77: 1-22. ↑ Heiligenberg, W. (1975) Electrolocation and jamming avoidance in the electric fish Gymnarchus niloticus (Gymnarchidae, Mormyriformes). J. comp. Physiol. A 103: 55-67. ↑ Hopkins, C. (1974) Electric communication: functions in the social behavior of Eigenmannia virescens. Behaviour 50: 270-305. ↑ Bullock, T., Hamstra Jr., R., Scheich, H. (1972) The Jamming Avoidance Response of High Frequency Electric Fish. J. Comp. Physiol. 77:1-22. ↑ Tan, E., Nizar, J., Carrera-G, E., Fortune, E. (2005) Electrosensory interference in naturally occurring aggregates of a species of weakly electric fish, Eigenmannia virescens. Behavioural Brain Research 164:83-92. ↑ Scheich, H., Bullock, T., Hamstra Jr., R. (1973) J. Neurophysiol. 36:39-60. ↑ Scheich, H., Bullock, T., Hamstra, Jr., R. (1973) Coding properties of two classes of afferent nerve fibers: high-frequency electroreceptors in the electric fish, Eigenmannia. J. Neurophysiol. 36:39-60. ↑ Bastian, J., Heiligenberg, W. (1980) Neural correlates of the jamming avoidance response of Eigenmannia. J. Comp. Physiol. A 136: 135-152. ↑ Heiligenberg, W., Rose, G. (1985) Phase and amplitude computations in the midbrain of an electric fish: Intracellular studies of neurons participating in the jamming avoidance response of Eigenmannia. Journal of Neuroscience 5-2: 515-531. ↑ Bullock, T., Behrend, K., Heiligenberg, W. (1975) Comparison of the jamming avoidance responses in Gymnotid and Gymnarchid electric fish: A case of convergent evolution of behavior and its sensory basis. J. Comp. Physiol. 103: 97-121. ↑ Kawasaki, M. (1975) Independently evolved jamming avoidance responses in Gymnotid and Gymnarchid electric fish: a case of convergent evolution of behavior and its sensory basis. J. Comp. Physiol. 103:97-121. Heiligenberg, W. (1977) Principles of Electrolocation and Jamming Avoidance in Electric Fish: A Neuroethological Approach. Studies of Brain Function, Vol. 1. Berlin-New York: Springer-Verlag. Heiligenberg, W. (1990) Electric Systems in Fish. Synapse 6:196-206. Heiligenberg, W. (1991) Neural Nets in Electric fish. MIT Press: Cambridge, MA. Kawasaki, M. (2009) Evolution of time-coding systems in weakly electric fishes. Zoological Science 26: 587-599.